George Clooney is Hollywood. He acts, directs, writes, produces and fully embodies what we all imagine when someone says "movie star." So, it should come as no surprise that he's this year's American Film Institute Life Achievement recipient. Ahead of receiving this big—and well deserved—honor, we've been thinking about all of the amazing roles that Clooney has played over the years...not including all the projects he's created or produced. He got his real big break as Dr. Doug Ross on ER, but you might remember that he was also on an episode of The Golden Girls and played Booker Brooks on Roseanne. Although TV is what got him noticed it's really his work in film that has set him apart in Hollywood. Even though he's only won one Oscar (for acting) he has been nominated numerous times. Roles like Governor Mike Morris in The Ides of March or Danny Ocean in the Ocean's franchise have cemented Clooney as one of the best of the best in the entertainment industry. He's taken on real-life stories like Good Night, and Good Luck and played all sorts of different characters over the past three decades. The Kentucky native has done comedies and dramas as well and with each role we are more impressed with his body of work. Since the star-studded gala where Clooney will be honored (by his famous friend and co-star Julia Roberts) won't air on TV until June 21 on TNT (it takes tonight, June 7) we've rounded up the star's best roles for you to look through. After so many years of working in Hollywood it's hard to narrow down which roles really define Clooney, but we've definitely tried. Check out some of his greatest characters below and vote for your favorite Clooney movie as well. PS: Feel free to re-watch any or all of these wonderful movies (and TV shows) in your spare time...they're all amazing. 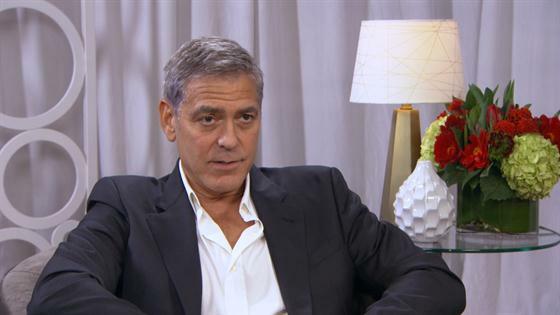 Watch George Clooney & Julia Roberts Interview Each Other! George Clooney was Danny Ocean, the leader of a band of thieves in Ocean's Eleven (and the two sequels that followed). His character was charming, handsome and had a mind brilliant enough to rob the Bellagio Hotel & Casino. If you love to laugh and want to see Clooney dressed as Caesar only to get kidnapped while in costume then you should watch Hail, Caesar! ASAP. Clooney plays Everett, who has broken away from the chain gang with two other convicts, in this 1930s-based film. Together the three search for hidden treasure and try to stay out of jail. The actor played himself in the hilarious Christmas TV special starring Bill Murray. The Kentucky native played former boy-genius inventor Frank Walker in the 2015 film who goes on a mission with a young teen to uncover the secrets of a place that only exists in their memory. In Gravity, Clooney (as Matt Kowalski) is the only person tethered to Sandra Bullock's character Ryan Stone as the two are lost in space. Clooney wrote, directed and starred in the iconic film about a World War II platoon that is sent to retrieve masterpieces from the Nazis and return them to their rightful owners. Clooney starred alongside Jennifer Lopez in the 1998 crime drama as bank robber Jack Foley. In case you forgot, Clooney played Batman AKA Bruce Wayne in the 1997 hero flick and we'll always love him for it. The Facts of Life was the actor's first real TV gig. He played the boarding school's neighbor, George Burnett, in 17 episodes of the hit comedy beginning in 1985. As he waits for his final assignment as an assassin, Clooney's Jack starts to make friends in Italy and fall in love, which could jeopardize his safety. Clooney played producer Fred Friendly in the 2005 film which was a biography about bringing down Senator Joseph McCarthy in the 1950s. The Ides of March earned Clooney another Oscar nomination for his screenplay, but fans remember him as Governor Mike Morris who is running for president in the film which also starred Ryan Gosling. Syriana earned Clooney his first and only Oscar. The film was loosely based on former Central Intelligence Agency agent Robert Baer and his memoirs from the Middle East and Clooney brought a version of him as Bob Barnes to life. In the 2008 film, a disk containing secret information gets into the hands of two people at the gym who will try anything to sell it. Clooney plays Harry, a marshal at the State Department who is cheating on his wife. Clooney's Ryan Bingham loves traveling and firing people for a living, but his travel lifestyle and frequent flyer miles are threatened when he meets a woman who flies as much as him, and has to deal with a new hire. The actor portrayed Lyn Cassady in this 2009 film, who claims to be a former member of the U.S. Army's New Earth Army. He tries to convince a reporter in Iraq that his unit employs paranormal powers in their missions. ER was the actor' biggest TV role to date and one of his most memorable characters of all time. He played Dr. Doug Ross for five seasons returning only when Julianna Margulies left the show (to tie up her storyline) and again on the series finale. Archie Gates (Clooney) and three other soldiers set out to steal gold after the Persian Gulf War that was originally stolen from Kuwait. On their journey they discover people who need their help and must rise to the challenge. Clooney was only on one episode of Friends, but fans still remember his cameo. He appeared as a doctor alongside his fellow ER co-star Noah Wyle in a 1995 episode and after treating Rachel (who was pretending to be Monica) they all went out on a date. The Oscar-winning film follows Matt King (Clooney) as he tries to reconnect with his daughters—one of which is played by Shailene Woodley—after his wife gets into an accident. Meanwhile he's trying to sell his land in Kauai and figure out what's next. Set in 1925, Leatherheads focuses on a brash football hero named Dodge Connolly (Clooney) as he tries to get his team from being a group of bar brawlers and losers to a united, winning team. From 1988 to 1991 Clooney played Booker Brooks on Roseanne. He was the supervisor at the plastic factory and a total dreamboat. Dr. Chris Kelvin (played by Clooney) is set to investigate the crew of a research station orbiting a bizarre planet, but when he arrives part of the team is missing. The 57-year-old actor stars alongside Mark Wahlberg in The Perfect Storm, which is about a sword-fishing boat caught in a killer storm in the North Atlantic. Which of George Clooney's most iconic roles is your favorite? Baird Whitlock in Hail, Caesar! Everett in O Brother, Where Art Thou?